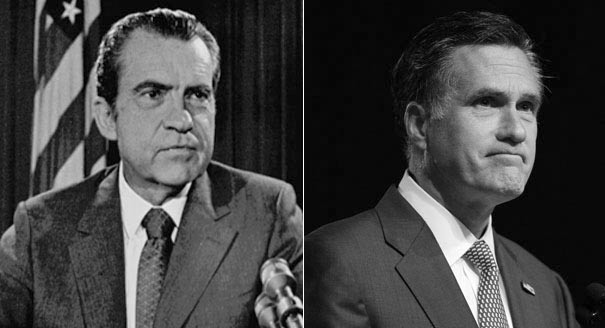 It’s sort of old news that David Axelrod compared Mitt Romney’s openness and transparency to Richard Nixon’s. I think he’s right, but what’s more fun is that Republicans have to decide whether that’s a vicious insult, given that I’ve heard many of them minimize Nixon’s, um, crimes in office. But that’s sideshow. Someone (and if I find the link I’ll update it) riffed on the other Romney-Nixon connection: that Nixon was the last Presidential candidate to be as socially awkward as Mitt Romney and actually win the Presidency (albeit funded by huge amounts of secret and, at least in Nixon’s case, illegal cash). I think that comparison misses something, both about the root of each man’s social awkwardness, and the dynamics of the respective elections. First, 1968 wasn’t a kind year to Democrats. The Chicago convention was a disaster that Humphrey left hobbling, and it’s still a decent bet that if the election had happened a week later Humphrey would have won. Second, 1968 had George Wallace. There’s no similar third party wildcard this year (and the most dangerous possibility – Ron Paul – hurts Romney). Finally, while Richard Nixon wasn’t the smoothest of men, he was fueled by a seething resentment of people who had grown up in privilege. (There’s a lot more on this in Rick Perlstein’s brilliant Nixonland.) Say what you will about Richard Nixon, but he didn’t inherit wealth or station, and that drove him through his entire life. So even though he was socially awkward, his background was one that many Americans understood. Nixon had very little respect for George Romney; imagine the contempt he’d have for Romney’s to the manor born son. The point is that Nixon was able to overcome his social awkwardness because it was part of a history of being disconnected with privilege. Romney’s is all about being awkwardly representative of privilege and disconnected from most people’s day to day lives. Money can buy you a lot of things, but it won’t give a rich guy a visceral understanding of the vast majority of the electorate. Or even convince that electorate that he has it.